Though I have no clue why, a few days ago I was seized with the idea of cooking a vegan carbonara—despite never having eaten carbonara in my life, vegan or otherwise. Perhaps I saw a recipe while perusing Pinterest and it lodged in my unconscious? Or maybe I’m just nostalgic for the Sims 2 and preparing a Goopy Carbonara for my hapless Sims? Who knows. But I had to try it. I fully intended to follow an existing recipe for this pasta dish. I had no frame of reference for how it should taste, and I only vaguely understood the premise: add uncooked eggs (and maybe cheese?) to hot pasta; wait for eggs to cook through (but not scramble!) and create a rich “sauce” that clings to the pasta. Top with bacon? So I began researching how to make vegan carbonara. But as I opened up tab after tab of vegan carbonara recipes, nothing seemed quite right. One recipe relied solely on silken tofu, which seemed like it would give a decent texture but would risk the end result tasting overpoweringly of soy. Another recipe used an entire half cup of Follow Your Heart’s VeganEgg —a product I appreciate in theory but am frequently disappointed with in practice—to get that clingy, eggy texture, which made sense, but I didn’t have a whole package of the product on hand. And a third recipe employed that ubiquitous vegan favorite, cashews, to add a nice rich mouthfeel, but that method seemed like it would create a more generic cream sauce, not carbonara. All these elements seemed useful in the end goal of creating a true carbonara, but not by themselves. I had to mix them. And thus, my very own vegan carbonara. A small addition of the VeganEgg provides that clingy texture, cashews offer a creamy and slightly cheesy flavor, and a small amount of silken tofu adds bulk. I included black salt to approximate eggy flavor and threw in a few scoops of nutritional yeast for cheesiness. 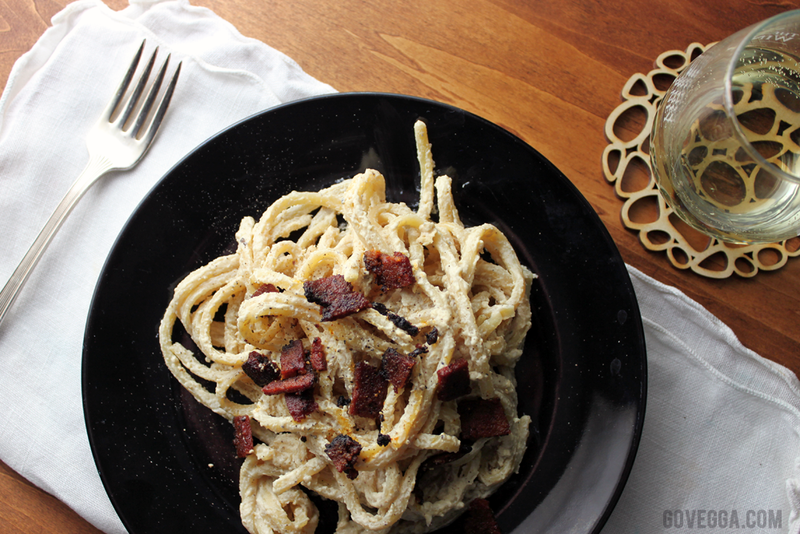 Topped with crispy bacon, my carbonara was a surprising and delicious success. It’s quite filling, too—I had leftovers for lunch the next day. Now that’s the measure of a true winner. Set your cashews soaking. If you have a high-powered blender, you can soak them briefly (I soaked mine while prepping the rest of the sauce); if not, be sure to start ahead of time as required by your blender. In a small bowl, add the VeganEgg and the cold water and whisk forcefully until the powder is incorporated. Set aside. In a large saucepan, heat the olive oil on medium. Add the onions and sauté for about 5 minutes, then add the garlic. Cook for another 3 minutes or until the onions are translucent. Turn off the heat and set aside, but keep the pan on the stove for later. At this point, start boiling a pot of water for your pasta. Drain the cashews and add them to your blender, along with the VeganEgg mixture, silken tofu, cooked onions and garlic, almond milk, lemon juice, black salt, nooch, and a few grinds of pepper. Blend on high until all ingredients are thoroughly incorporated. Taste for salt and pepper and adjust seasonings as necessary. Set sauce aside. Heat a small amount of oil in the pan you used for the onion and garlic and add the chopped bacon. By now, the pasta water should be boiling. Add pasta and set a timer for al dente pasta, following the package’s instructions. As the pasta cooks, monitor the bacon. It should heat through and become somewhat crispy. When the bacon is done (about 7 minutes), you can either leave it in the pan (so that it mixes in with the pasta and sauce) or scoop it into a small bowl (so you can top the pasta with it). Either way, turn the heat off but leave the pan on the burner. When the pasta is finished cooking, drain it and immediately add it to the hot pan. Pour the sauce over it and cook for about 4-5 minutes on low heat, using a spatula to coat all the pasta. When the sauce starts clinging to the pasta and darkening a bit in color, it’s ready. Serve topped with bacon and parsley (if using) and a few more grinds of fresh pepper. Enjoy! I used Sweet Earth Natural Foods‘ Benevolent Bacon, but you can go with any brand you prefer. You could also make your own crumbles from tofu or tempeh, although a fattier product works best here—the fat released in cooking helps everything cling together at the end. If you don’t have the VeganEgg on hand, I think you can forgo it. You’ll just lose some of that clingy, eggy texture. Feel free to experiment with other ingredients in its place! I used linguine for my pasta, but spaghetti and rigatoni are also common choices. A quality vegan parmesan would be a perfect addition here. If you have it, swap it for the nutritional yeast and use as much as you need to get a nice cheesy flavor. Timing is important here; you want the spaghetti to be nice and hot when you add the sauce. For that reason, make sure to follow the steps as written. Note: This post contains affiliate links. If you purchase something through my link, it costs nothing extra for you, but I get a few pennies to help cover hosting costs. Such perfect timing! Yet another wonderful use for the VeganEgg, and one I’ll defi n Italy have to try ASAP. 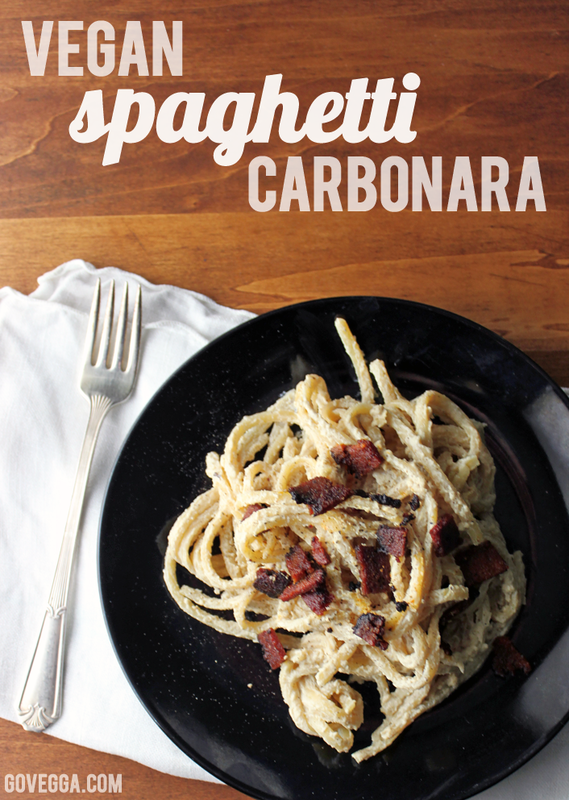 I’ve still got some in the pantry and it has carbonara written all over it.